Training archive at Run For It! I keep dreading the idea of posting, I feel boring! I don’t have anything to say, I don’t have cool pictures to post. well, I feel bad for abandoning the blog, especially with all 3 of my spam comments! I can’t abandon the spammers now when I’m just starting to be noticed by them. Well, whatever. Today I ran 14 miles for a grand total of 37 miles this week. My training plan had 16 miles scheduled, but I pushed myself way too hard and too fast yesterday on my group run and my legs were toast today. Combined with an insufficient pre-long run breakfast, I was hungry, exhausted and decided to pack it in after 14 not very fast miles (2h 18m or 9:51/mile). I ran a new 9 mile loop that I haven’t tried before, and for the most part, it was nice. A wooded and windy road with hardly a car in sight, it reminded me of running in Delaware. Long runs are tough mentally for me, I struggle to just let go and get in that running zone. Instead of just zoning out and letting the miles tick away, I struggle. I think too much. I take gu breaks. water breaks. walk breaks. I keep breaking things up instead of just running. I think that finding a running partner for my long runs would make a big difference for me since my long runs are such mental games anyway, so who knows what I’ll come up with. Other than Saturday group runs, I run alone. I need to change that. 9 weeks left to marathon Saturday, planning on 40+ miles next week. On Saturday morning, I met up with the local running group again. Last week, I was the only woman out of the 6 or 7 people who attended, but yesterday it was completely reversed with 5 or so women and only 3 guys. I’m really enjoying running with a group and I think I may have found a training partner to do some of my week runs with. We ended up running 5 miles together and I finished up with a 1/2 mile run home for a total of 5.5 miles in 47:06 or 8:33/mile average. This morning I ran 13 miles, the longest I’ve run so far in this training cycle. I woke up this morning at 5am when two certain cats decided to climb on my head. The joys of pet ownership. I couldn’t fall back asleep because I was hungry and keyed up, but my alarm clock was set for 6:30, so I stayed in bed until around then. Weatherbug said 9*F, so I bundled up in a thin long sleeve tech shirt, a thicker pullover tech shirt, a very thin shell type jacket, balega crew socks and tights. Ugly Hat of Many Colors and fleece gloves too. 1/2 a cup of nasty left over coffee and a bowl of cereal and I was out the door. And it was verrry cold. My hands legs were especially chilly. I wore my fuel belt since there aren’t any water fountains on my route, which always makes me feel like a dork/weirdo. I decided to run around the lake, a 7 mile loop and then do another shorter loop to make up 13 miles. I felt pretty good for the first half. Despite taking some chocolate Gu, I started to get pretty tired, especially after mile 8 and having my water bottles freeze didn’t help matters. But I kept going and finished strong with a final mile of 8:48. I’ve been having terrible writer’s block with this entry. Every time I sit down to write something, I can’t think of anything worth posting. Not a bad week, especially considering I was pretty sick on Monday, so I was pretty slow that day and took some walking breaks. I would have liked to do a long run on Saturday of 10 or 12 miles, but I decided to try running with the local running group for the first time instead.It was really great actually, and I may dedicate an entry to running with a group in the future, but for now I’ll just say that while I did run considerably faster than I am used to running by myself, I didn’t get the mileage in. I think this week I may run for 40 minutes or so before meeting up with the group and then tack some additional miles on to the end if needed. Or I might just plan on getting my long run in on Sunday instead, I’m really not sure which is the better plan. I’m concerned because as of yesterday (Monday, Feb 8), I am 12 weeks out from the Wisconsin marathon and my training has been generally pretty so-so up to now. I really need to work harder on getting my long runs done every weekend or I will be suffering on marathon day. And I still don’t have a marathon training plan! I’ve been making it up as I go along, which I don’t think is a good idea. I should probably spend this morning reading up and deciding what I want to do. Any thoughts? 10 things that make me happy, some running related, some less so. I’m keeping humans off this list, so just assume my husband and family and friends and such (usually) make me happy. 10. Always Sunny in Philadelphia – this show is the bestest. Liking this show is a pre-requisite for being my friend. (well not really, well maybe really). 9. Pizza and wine nights – how can you not love them? 8. Shorty shorts – I miss these suckers – Wisconsin winters mean my legs have haven’t seen the sun since about mid October. 7. Books – I am a librarian, nuff said. 6. 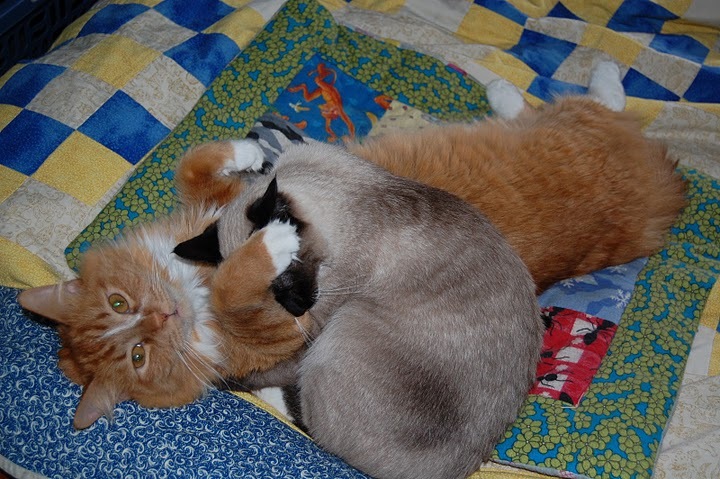 My kitties – they drive me nuts, but they are sweet and I love them. Do wish they wouldn’t spend so much time plotting ways to interrupt my sleep. 5. Oatmeal and Peanut Butter – My number one breakfast since high school. I have probably eaten 5000 bowls of this stuff and I never get tired of it. 4. Ipod Nano – Love my nano, and by proxy – Excellent music and running podcasts. 3. Coffee, sweet sweet coffee. Preferably freshly ground Alterra Columbian roast. 2. 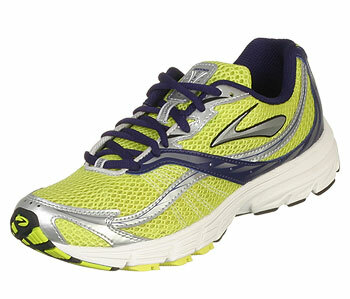 Brooks Launch! – Brooks are the best and these ones make me feel SPEEDY. Look at me so fast and intimidating with my lime green shoes. 1. Mr. Garmin – my OCD LOVES my garmin. Oh the numbers, oh the obsessing. Be still my beating heart. Got my entry confirmation today!